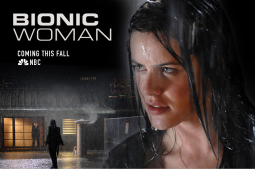 I didn’t expect this: Amazon.com has got the pilot episode of Bionic Woman for free on it’s site. This is NOT like the old Bionic Woman show, that’s for sure. And of course NBC has the Bionic Woman website setup too. Two questions: 1) Why did NBC choose to allow Resident Evil to be a sponsor? It sets people’s expectations for what the tone of the show is going to be like, and I doubt they want it perceived as a horror show. and 2) Why in the world did NBC let someone put up that stupid sliding navigation button on the home page for that site? People want to navigate to pages quickly, not watch a slider go up and down, moving past the button they really want to press. Anyway, you can download that show to your TiVo or PC. If you haven’t yet, go check out the show – it’s free !